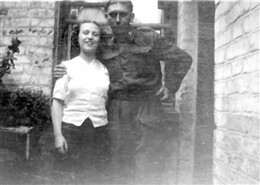 Eileen was born one week before the First World War finished, on 3 November, 1918, on Palace Street just south of Victoria Street. She lived there with her parents and grandmother until she was five, then moved to southeast London near the Surrey Docks. She was twenty-one years of age when the Second World War began; she started working in an office at a factory that made camouflage. During the war, her home near the docks wasn’t in a very safe area since the Germans targeted ships carrying food supplies that would arrive there. Their house did not have a large enough garden for a shelter, so when the air raid sirens went off Eileen would run across the street with her hands over her head, her cat Nobby following her, to her neighbours’ Anderson shelter to take cover. On the day the war ended, Eileen went with thousands of other Londoners to Buckingham Palace to see the King and Queen come out and greet the people of the city with big smiles. 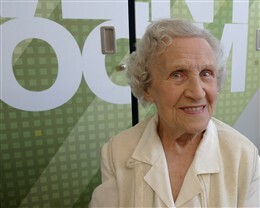 On the day Eileen recounted her war story, she was ninety-one years old! This page was added by Camilla Bergman on 17/08/2010.